A long-standing fascination with tropical islands, fuelled by a recent sojourn in Jamaica working with the Jamaica Tourist Board, drew me to the Seychelles. My initial experience of the Caribbean was a good foretaste, but this was something different, a destination in exactly the opposite direction and, unlike the relatively-crowded region in which I had been working, a thousand miles from anywhere. This was brought home to me on my first visit, entailing a 13hr flight from the UK far out into the Indian Ocean to the main island of Mahé. The Seychelles is made up of several such tiny drops of varying size in a very big sea; the other two chief ones and most accessible being Praslin and La Digue. Airline economics being what they are, non-stops were later ended and the destination, though popular, remains a second-tier favourite with UK visitors because of it. Air Seychelles flights, featured by Virgin Holidays among other UK tour operators serving the islands, depart twice a week from Heathrow on Fridays and Sundays with a stop in Italy, although with no change of aircraft. Links are also provided by Etihad, which owns 40% of Air Seychelles, via Dubai. 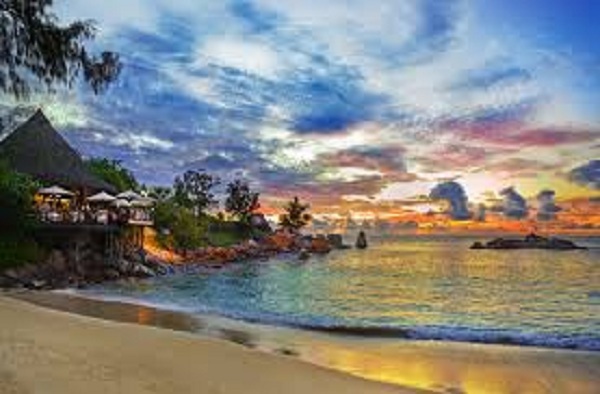 In 2015, more than 270,000 tourists visited Seychelles, the main markets being France, Germany, Italy, the UAE, the UK, China, South Africa, the Russian Federation, Switzerland, and India. Among European nations, it is the French whose influence is still most evident here, although the islands are and have long been proudly independent and have an atmosphere and charm very much their own. To quote the brochures, it is a land of white-sand beaches – by far the leading attraction, along with their attendant upmarket hotels – plus world-renowned coral reefs and steep hillsides covered in coconut, cinnamon and banana plantations. Loafing, diving and boating, possibly in that order, are top pursuits for visitors. Then there are the forests, wild orchids and more, most famously to be found with other wonders in the Vallée de Mai nature reserve on Praslin. Local legend has it this was the original site of the Garden of Eden, a view shared by early visitor General Gordon, of Khartoum fame. It is also a Unesco world heritage site, the body describing it as having “the vestiges of a natural palm forest preserved in almost its original state”. The valley is also one of only two places where the rare coco de mer palm grows in its natural state, the other being the nearby island of Curieuse. Island-hopping, by boat or plane, is a popular way to see the contrasts. A large part of the promotional effort to entice visitors to the islands falls to the national carrier. A relatively-young company, Air Seychelles was established in 1978 and began long-haul service in 1983. Its fleet consists of one 254-passenger A330-200 and two 136-passenger A320-200s, plus four DHC-6 Twin Otter-400s and two Twin Otter 300s each carrying 19 passengers. The latest economic survey of the islands says the airline in 2016 is expected to carry close to 549,000 passengers, some 348,000 of whom will travel to and from the Seychelles. Among these, some 106,000 will be international visitors predominantly from Europe, Africa and Asia, whose tourism-related spending on accommodation, food, and leisure activities will amount to US$170m. Air Seychelles’ domestic services, an integral part of the Seychelles’ aviation network, will carry 201,000 passengers in 2016 on scheduled flights to and from Praslin and charter flights to other islands in the archipelago. Another major player is Emirates, which carried more than 180,000 passengers to and from the Seychelles in the 2015/16 financial year and recently renewed its support for tourism there by extending its global marketing agreement with the islands’ tourist board. Regional senior vice-president for commercial operations Orhan Abbas said: “The Seychelles is a very important destination to Emirates, and this explains why we are renewing our commitment to promote the islands’ attractions around our global network.” He said the new programme would involve developing a series of joint activities with the Seychelles aiming to increase the visibility of the destination with Emirates’ clients, including tourism trade shows and fairs, familiarisation trips, product presentations and workshops. In June 2015, Emirates increased its capacity to the Seychelles, when it switched from the A330-200 used on one of the two daily services to a larger Boeing 777-300ER. Its introduction increased overall capacity on the route by 1,722 seats per week and made the route an all-B777 operation. Waiting to greet the visitors is a collection of top hotels and a sprinkling of B&B and boutique places to stay. Leading contenders include Le Méridien Fisherman’s Cove, Four Seasons Seychelles and Banyan Tree Seychelles, all on Mahé; the Constance Lémuria, spread over three white-sand beaches on Praslin, and the Hilton Seychelles Labriz Resort on the third-biggest island, Silhouette, ideal for snorkellers. As for finding somewhere to eat, TripAdvisor lists 156 restaurants around the islands, 26 of them in and around Victoria, the capital and only town on Mahé. The Mahé collection includes La Pause and Del Place, both in Victoria, and La Perle Noire at Beau Vallon. On La Digue, look for Chez Jules; on Praslin, a popular choice is Restaurant Paradisier. Cruise regulars should note that the islands are on most around-the-world itineraries, with Cunard's namesake the latest to visit Victoria.